The best way to transmit this concept is to appreciate that the entire Universe operates on the same principle of vibrational energy. The late American Comedian Bill Hicks put it perfectly when he said this "all matter is merely energy condensed to a slow vibration, that we are all one consciousness experiencing itself subjectively, there is no such thing as death, life is only a dream, and we are the imagination of ourselves." 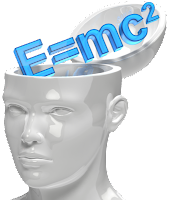 When Einstein discovered that matter is energy he opened the door to merging science and metaphysics. Scientists have proven that energy cannot die, it can only transform and by its very nature energy must move forward or backward. To stand still is stagnation resulting in transformation. You are energy, your skull that appears solid is actually trillions of swiftly moving molecules orbiting each other at a specific vibrational rate, depending upon how harmonious you are.